WASHINGTON (Aug. 20, 2015) -- One of the first things Col. Rodney Painting noticed on entering New Orleans 10 years ago, after Hurricane Katrina had left the city flooded, was the smell. "There is a unique smell that comes along with a house being flooded," Painting said. "You can smell the wet sheet rock, the wet insulation, the wet furniture. It was odd. The entire city smelled like that." Painting, a National Guardsman, serves as commander of the 225th Engineer Brigade. As a civilian, he serves as director of capital improvements for the Louisiana Recovery School District, and administers the $1.8 billion Federal Emergency Management Agency grant that is meant to rebuild schools damaged by Katrina. When Katrina happened, Painting was a lieutenant colonel, and was commander of the 205th Engineer Battalion. Ten years later, New Orleans has largely recovered from the devastation rained upon it as a result of the hurricane. That storm landed in the city Aug. 29, 2005. While the wind from the storm caused damage in New Orleans and surrounding areas, and wind and flash flooding from storm surges caused damage in neighboring Mississippi, New Orleans was unique in that the flood waters came in and didn't leave until months later. Nearly 80 percent of the city was underwater. "But even after the water started to go down in St. Bernard Parrish and in Orleans Parrish, it was an eerie smell," Painting said of the city. "And even into the fall, as summer faded away and temperatures started to drop into the 70s, the 60s, and even the 50s - you still had that odor. It was an odd smell." After Katrina hit the southern United States, causing the most damage in Louisiana and Mississippi, National Guard Soldiers and airmen from all 50 states, as well as first responders from the local area and from around the nation, descended on the afflicted areas to provide relief, to clear away damage from roads, and in New Orleans, to rescue citizens, who were trapped in their own homes by the floodwaters. Maj. Timothy Cleighton grew up in Slidell, Louisiana. It's a city just north of Lake Pontchartrain, and is considered, like many communities on the "north shore" of the lake, to be part of the Greater New Orleans Metropolitan Area. Cleighton serves now as a full-time National Guardsman with the 204th Theater Airfield Operations Group. But in 2005, he was a first lieutenant and UH-60 Black Hawk pilot with the National Guard's 1/244th Air Assault Helicopter Battalion. He was also a graduate student. Just before Katrina, his unit had returned from a 14-month deployment, mostly in Iraq. "This was the first real 'all-hazards' event I'd been a part of as aviation," Cleighton said. "Previously I was in the engineers. My only experience with hurricanes or tornadoes was when I was maybe an E-3 gate guard over in one of the neighborhoods, trying to keep people from looting. And that was a small event. Katrina was the first full-scale natural disaster I was part of." He said in advance of the hurricane, his unit evacuated aircraft from New Orleans to Houston, Texas, and Alexandria Esler Regional Airport - about 162 miles northeast of New Orleans. Once the damage to New Orleans was evident, he said, they moved the aircraft back to the Louisiana capital of Baton Rouge to stage their operations from there. Those operations, he said, started out pretty intense. Not quite 24-hour operations for him, but 18-hour days at least. He said they were flying missions in New Orleans every day, all day, to rescue those who were trapped by the flood waters. "Because it was such a high-impacted area with the number of people, our mission every day was to go fly into New Orleans and rescue as many people as we could. That was the task," he said. He said initially, with the number of helicopters flying around the city, and from so many units and agencies, there wasn't really a plan for who would go rescue people in a particular part of the city. "What we kind of did was fly around, find a spot without a lot of activity, and start searching there," he said. "It was amazing the amount of deconfliction we could do internally. You'd see an aircraft, or five, over in the north side. So we'd slide over and go to the south side and start looking. "We'd put a wheel on top of a house and throw people on, or we'd land in the middle of the street, or the levy. Anything we could do to pick them up. I didn't have a hoist. I was kind of limited with what I could do." Initially, Cleighton said, they brought those rescued to the Superdome in New Orleans. Later, they started taking citizens to the New Orleans International Airport. "Once we did that it was just - I had to have been, sometimes, number 50 in line to drop people off," he said. "That's with a full aircraft full of people. All of us lined up to drop people off. I've never seen so many aircraft." Cleighton said he and his crew flew long hours for four or five days - from maybe 6 a.m. out of Baton Rouge until nightfall. Later, he said, relief came when other pilots from his units showed up to start relieving him and his crew. But then it was too late for the college student to start back to his regular schedule. "I was in my master's program," he said. "And I ended up just not going to class, and withdrawing, and started running missions." After the bulk of the rescue missions ended, he said, he ran other flying missions, including moving VIPs and other personnel around New Orleans and other parts of Louisiana. Included among his passengers were then-governor of Louisiana, Kathleen Blanco, and then-adjutant general of Louisiana, Maj. Gen. Bennett C. Landreneau. "She was doing an assessment," Cleighton said of the governor. "We flew from the north shore of Lake Pontchartrain to the south shore, so she could address the damage." "It really hit home," he said of the flood. "Not so many times do you see a disaster where you see eight feet of water around a bunch of houses where you grew up yourself ... or you have friends that grew up in the area. Just to see the impact on them. There were a couple of people who had lived in the area that was flooded with water up to the rooftops. To see their reaction, it was gut-wrenching. They grew up on that street, or played football there." Painting said before Katrina hit, he'd been in his unit's headquarters in Bogalusa, Louisiana. The eye of Katrina passed over that city and "rode the state line" between Mississippi and Louisiana all the way to the north, he said. Helicopters lift off at New Orleans International Airport, Sept. 2, 2005, to rescue residents of New Orleans, who were stranded by the flooding that followed Hurricane Katrina. Afterward, his team was responsible for clearing highways in and around Bogalusa, Slidell, Covington, Franklinton and Hammond - all cities just north of Lake Pontchartrain. In fact, his area of responsibility, he said, was from the north shore of the lake about 40 miles north to the state's border with Mississippi. "We cleared a significant amount of land," he said. Additionally, his unit was responding to the storm surge from the lake that had hit Slidell. "We were doing house-to-house checks in that area, along with the local sheriff office." The storm surge had also affected Mandeville and Madisonville on the north shore. "We were going house to house, doing searches, and using the FEMA [Federal Emergency Management Agency] marking system on the doors," he said. And at the same time, communications lines with higher headquarters were down. "It was like 1862 - like the Civil War," he said. "We had to send runners, to a certain point, to deliver hard copy messages. I remember specifically we took a convoy, after it took three days to get the roads cleared." Eventually, Painting said, he was able to link up with an Air National Guard unit that had communications capability. They stayed together for about two weeks to keep a line of connection open with the state command group to direct them on missions. While Painting said his primary area of responsibility was north of the lake, eventually "the severity of the situation in New Orleans basically dictated that nearly every National Guardsman had to surge toward the city." About a week after the storm struck, his unit went down to New Orleans to work alongside units already there, including the 769th Engineer Battalion, and the 527th Engineer Battalion. With a unit of about 600 Soldiers, and for about six months, he said, they did such work as levy repair, debris removal, and movement of huge sandbags using sling load operations. "We ran a gamut of everything," he said. "The devastation in New Orleans is tremendous," he said. "And when the flood waters went down, it left a fine layer of silt everywhere. You could always identify how high the water was on a building by the water line. And each day the water would drop it would dry at a different line. You had a line, like when your children grow up and you have them stand next to the door and you mark off a different year of their life by how tall they are. You could gauge the water going down day by day, with various water marks." Heading southbound toward Belle Chasse, a community also considered part of the Greater New Orleans Metropolitan Area, and also home of the Naval Air Station Joint Reserve Base New Orleans, Painting saw more mind-boggling damage that came as a result of flood waters. "There were two fish trawlers that had washed up onto the highway," he said. "Like ships, lying in the middle of the road. And further down the road, coffins and caskets floated in from a cemetery. All the burials in that part of Louisiana are above ground. Just like in New Orleans - they call them the 'cities of the dead.' They are all above ground because the water table is so high, so coffins float up if there is a flood. And there is also a huge citrus industry down there. So you had dead cattle that flooded in, you have these old vintage caskets that had floated in from all these old cemeteries, and you had millions of citrus lining the highways." As part of his civilian job today, Painting said, he is reminded daily of the damage from Katrina. "We were in a school a few weeks ago ... and we walked into two or three classrooms in a row and the electric clocks were all stopped at the same time, from when the power went out at that school," he said. "You still have the school dates written in chalk in the corner of the chalk board from the teacher's first lesson that never really happened." He said Katrina is like 9/11, in that it is a significant marker in people's lives by which they place other events. "For people in South Louisiana, it is a milestone in our lives," he said. "We determine things as before Katrina or after Katrina." "The biggest takeaway here is that a tragedy like this can happen to just about anybody," he said. "And depending on how the community is prepared for it before, that will dictate how they react afterward. It takes a short time to destroy a community. But it has taken 10 years here to get back to normal." Painting said the nation and the National Guard in Louisiana are now better prepared than before Katrina for another similar disaster. Painting and "about 100 percent" of his Soldiers stayed on duty in support of relief efforts for about six months. Even those Soldiers whose own homes had been destroyed stayed on to work, he said. "They returned to duty the next day," he said. "When you talk about selfless-service, these guys were the epitome of that." Watching the news in the summer of 2005, one might have overlooked that Katrina had hit other parts of the United States besides New Orleans. Just 60 miles east of that city, in Gulfport, Mississippi, and further west in Pascagoula, Mississippi, the National Guard there was also dealing with the aftermath of Katrina, which left a different set of problems for the state. 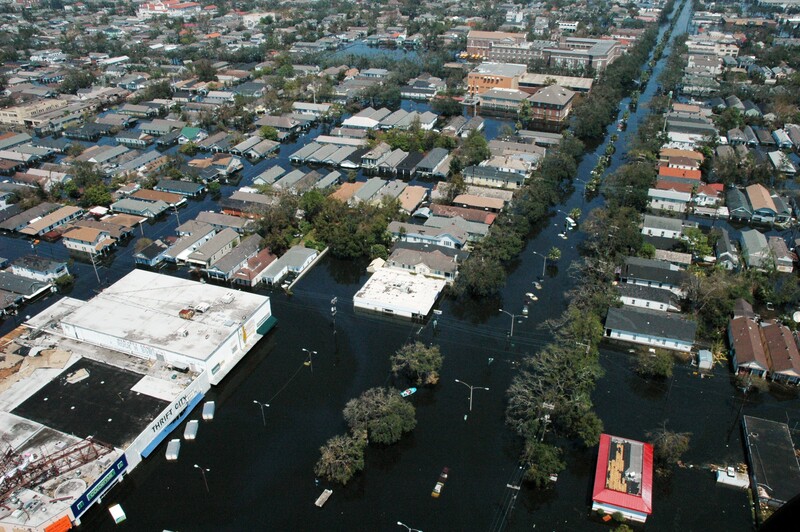 "The average American thinks Katrina only hit New Orleans," Col. Lee W. Smithson said. "But it didn't. We had a greater swath of damage in Mississippi than New Orleans did. Mississippi has 82 counties. Of those, 80 had some type of disaster declaration." Smithson serves as director of military support for the Mississippi National Guard. He said during Katrina, the Guard became the solver of problems nobody else knew how to deal with. At the time, he was responsible for the six southern counties in Mississippi, to include Pearl River, Stone, George, Jackson, Harrison and Hancock. In Gulfport, he said, home to the third-largest container port in the Gulf of Mexico, one of those problems reared its head. "Our two biggest exports here are poultry and shrimp," he said. "The port was full of poultry and shrimp when the storm surge washed all those containers off the port in Gulfport. We had a massive bio-hazard along the shore of Gulfport. Nobody knew what to do with all the dead shrimp and poultry. The local responders came to the Guard and asked us to get rid of it." He said the material couldn't be dumped in a landfill, because it would contaminate the groundwater. They loaded up all the material into dump trucks, using front loaders, and brought it out into the Gulf, past the barrier islands about nine miles to the south, and dumped it there. 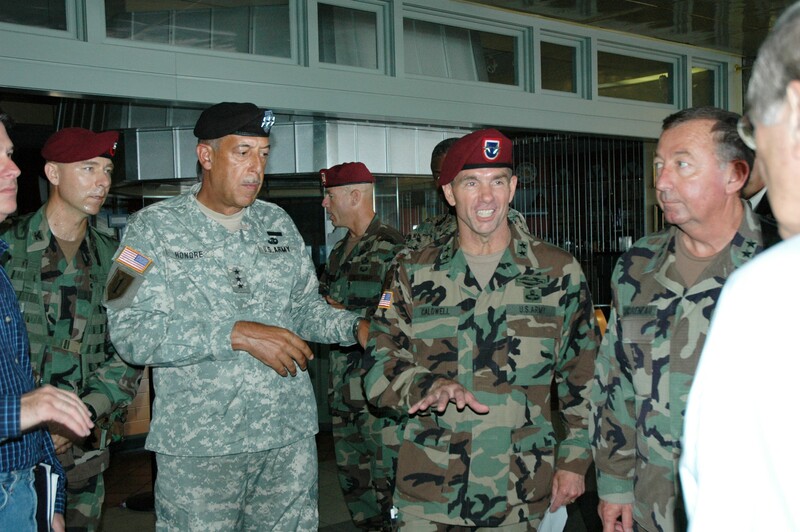 Lt. Gen. Russel L. Honore;, commander of Joint Task Force Katrina, then-Maj. Gen. William B. Caldwell, and then-adjutant general of Louisiana, Maj. Gen. Bennett C. Landreneau, meet with reporters at New Orleans International Airport to discuss relief operations for Hurricane Katrina, Sept. 4, 2005. Donald Rumsfeld, defense secretary at the time, is shown at the right of the image with his back to the camera. "We did so much more than we normally do," he said. "We had to be the coastal problem solvers." While in New Orleans the levies broke and left the city flooded for months, in Mississippi, the flooding didn't last long. It moved in and out fairly quickly, in advance of the hurricane passing over, as part of a storm surge. But the storm surge had been devastating nonetheless, Smithson said. His team weathered Katrina at Camp Shelby in Hattiesburg, Mississippi. It's about 70 miles north of the coast. On the afternoon of Aug. 29, he and about 125 military police, 100 engineers and 150 highway patrolmen traveled south to Gulfport. "It took us from 5 p.m. in the afternoon until 11 p.m. that evening to clear all the trees off the highway to get down there," he said. And when the sun came up the next day, "we were blown away by the amount of damage that had been done there in Gulfport." "We had a 32-foot storm surge," he said. "We had never seen a three-story wall of water anywhere in the United States. We had a tsunami 32 feet tall the whole length of the coast." That wall of water, he said, went up to a mile inland, except where there were rivers and bays - there it went farther inland. "We had a wall of water, 10 miles inland in Hancock County," he said. And water also pushed up the Jordan River. Bay St. Louis and Biloxi Bay faced similar devastation. Normally, he said, the barrier islands, about 9 to 12 miles off the coast of Mississippi, would protect the coast, he said. "But you can't protect against a 32-foot storm surge." Lt. Col. John B. Brown serves as the deputy human resources officer with the Mississippi National Guard. When Katrina came in 2005, he was a liaison Guard officer to Pascagoula in Jackson County. He said that the devastation in Pascagoula, as a result of the storm surge there, was the worst he's ever seen. "It reminded me [of] a third-world nation," he said. "Just because of the dirt and grime. Everything was covered in mud. The streets - you couldn't tell they were paved - they looked like a mud street. The people were out doing what they needed to be done." As a liaison officer to Pascagoula, Brown led a composite team of 25 Soldiers there in advance of the storm making landfall. "As liaison officer, our job was to coordinate with the emergency management coordinator and let him know what assets we had available and what were our capabilities," he said. "We acted as kind of a sounding board; he'd say what he needed done and ask if we could do it. And if we could, I'd go through the proper procedures to request and get those assets allocated to Jackson County." He went down with military police and engineers. The engineers, he said, brought trucks that could evacuate people in high water. "The water rises before the storm hits. So we have time before the storm actually makes landfall to make evacuations, and we needed high-water vehicles to do that." After the landfall, he said, the small composite team he had been in charge of went back to their organic units. 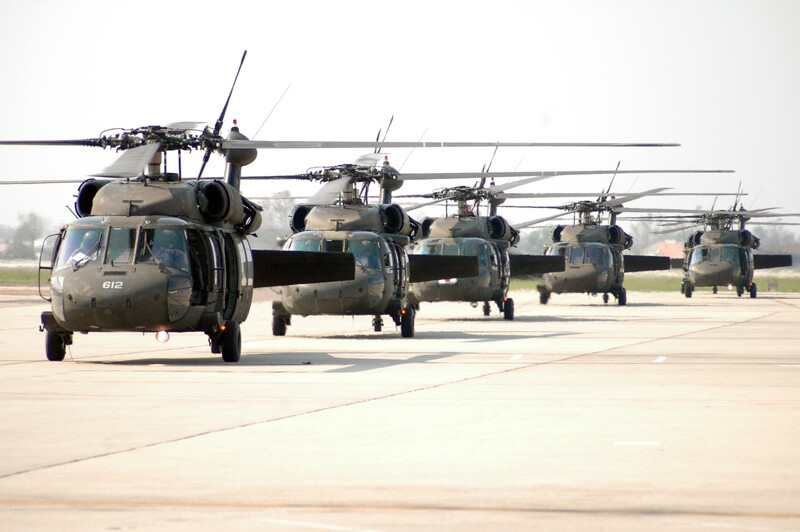 The Alabama National Guard sent a task force of 2,000 Soldiers into Jackson County to provide assistance. "They were fully prepared, and fully organized for the task they came to do, and did a fantastic job," he said. "They were there within maybe two days after landfall." Brown said that one of the things that makes him proud of being a Mississippian is that the citizens of Pascagoula didn't wait for help to arrive before getting to work on their own. "They started doing what they needed to do: clearing roads, doing house-to-house searches," he said. "As soon as the water left, they were out there straightening up stuff. Everybody we were working with down there was affected by the storm, because they all live there. They put all that aside. They were policemen, or worked for the Red Cross, or work for the city. They all lost something. " Smithson said after Katrina, the Guard in Mississippi cleared 3,900 miles of roads with their engineering effort; handed out medicine and 1.2 million meals, ready to eat, or MREs, and almost a million gallons of water by air - which is something they hadn't expected to be asked to do - and distributed an additional 5.4 million gallons of water and 3 million MREs to civilians, across 37 counties, at ground-based points of distribution. In Mississippi, like in Louisiana, there were communications problems. But Smithson said that as a result of those communications problems, he learned something about military leadership. "If the commanders out in the field know what it is the big commander wants, his intent, and they understand what their missions are, they will figure a way to make things happen," he said. After Katrina, he said, there was a Department of Homeland Security grant to build the Mississippi Wireless Integrated Network - a voice and data network "that is second to none." It allows communications across the state, even off shore past the barrier islands. During Deepwater Horizon, he said, the National Guard could fly helicopters out to the spill site and communicate with leadership. Brown said that while the debris and the trash and the leveled homes are now gone in southern Mississippi, reminders of the storm are still evident. "You can still see some of the devastation. There are still concrete slabs that haven't been rebuilt," he said, including slabs where pre-Civil War homes once stood. "Katrina is the high watermark of hurricanes. Every year when we go through hurricane season, we ask will it be another Katrina. It's still on everybody's mind." If another storm comes, he said, he thinks the National Guard will be ready to provide support. And he said he thinks that after Katrina, and other storms that have been endured by Mississippi, the residents in affected communities will welcome Guardsmen. "Just the sight of somebody in a BDU [Battle Dress Uniform] or an ACU [Army Combat Uniform] uniform brings calm," he said. "Even [if] it's just one or two Guardsmen there trying to assess damage, people know help is there."